Reaching the customer – on a journey beyond the customer life cycle – We have moved – Follow us on www.telestehub.com! What could be more important to our business than improving sales and customer relationships? In order to keep and get customers, we need to understand how and in which situations we contact our customers, how the customers’ experience of us is formed, and how we can add value to our customers. In short, we need to know when and how we are reaching the customers. “Customer touch points” include the sales force, our products and their usability, company websites, annual reports, quotes, invoices, agreements, and much more. Each of these touch points has a different purpose and a different impact on how the customer experiences us. Combined together, they define the overall impression the customer has of us. Usually, customer experience does not begin and end at a single touch point. It is encompassed in multiple points that form the entire customer life cycle from the customer’s initial awareness of us to the ordering of products and after-sales services. During the entire cycle, our goal is to reinforce our value proposition with the customer and fulfil the customer’s expectations. Teleste has always been committed to customer understanding, and customer-centricity is one of our key values. During sixty years of operation, we have established some customerships that have lived strong for years, even decades. Long-lasting cooperation with customers has brought us to think if there could be life also beyond the customer life cycle. Should we move from a cycle to a journey? 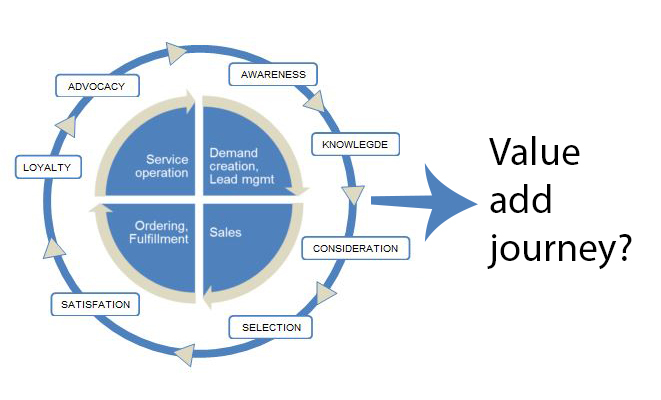 And should this journey add value both to the customer and us? A value added customer journey brings along issues like solving the customer’s challenges, sharing technology insights and visions, developing mutual competencies and social networking. On a journey, our customer touch points are multiplied, and subject to constant change. From our point of view, this means that points turn into processes, and knowing our customer becomes growing together with the customer. The article was published on Teleste’s website in autumn 2014.